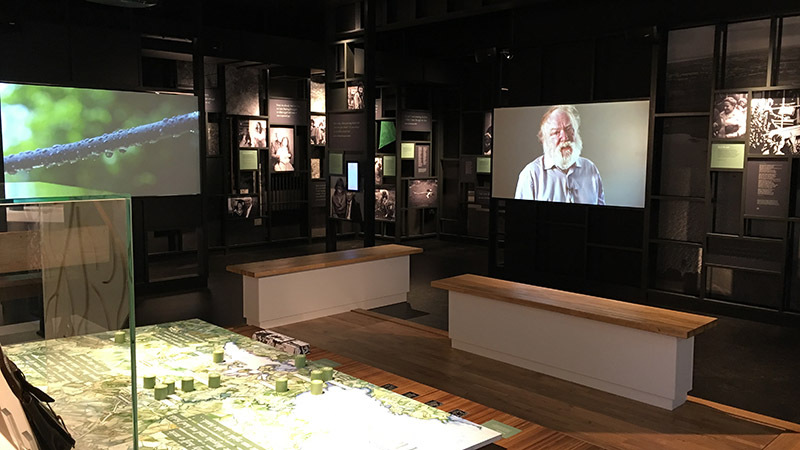 Noho recently completed work on Seamus Heaney HomePlace, a purpose built interpretive space in Heaney’s hometown of Bellaghy, Co Derry. Noho delivered a wide range of content and services for the exhibition and for the process leading up to installation. We first created a promotional video for the proposed space. At the same time we set up a website that captured testimonials from invited contributors ranging from Helen Vendler to Stephen Fry. The website featured an animation that explained to the user how to use their webcam to record their piece. The contributors also had the option of coming to our office to record their testimonial. 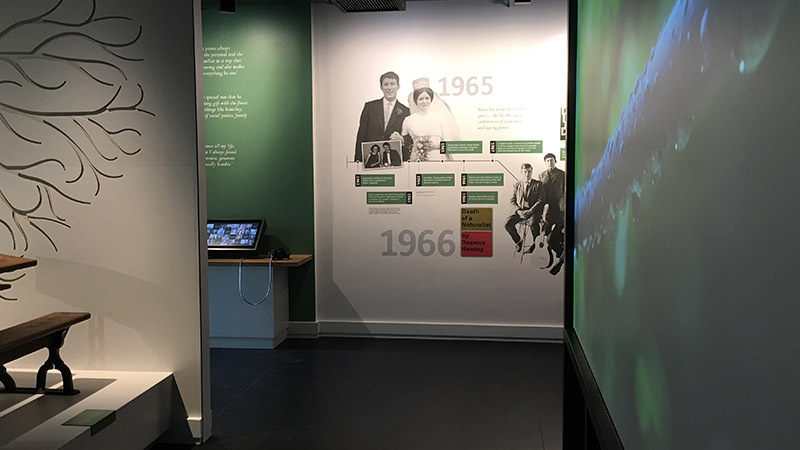 These video segments were then used within touchscreens and projections in the exhibition and we have designed a CMS to display more content as it is recorded. As part of the AV experience within the exhibition we shot and sourced film material of the surrounding area as sources of inspiration for Heaney’s work. These run together as a three projector setup interspersed with some of the testimonials from the touchscreens. We also edited a piece that tells the story of him winning the Nobel Prize, using archive footage from RTE. We were commissioned to create a circular animated piece that evokes the inspiration for some of his most famous imagery. Our animators immersed themselves in Heaney’s poetry to create a suitable piece for the space. 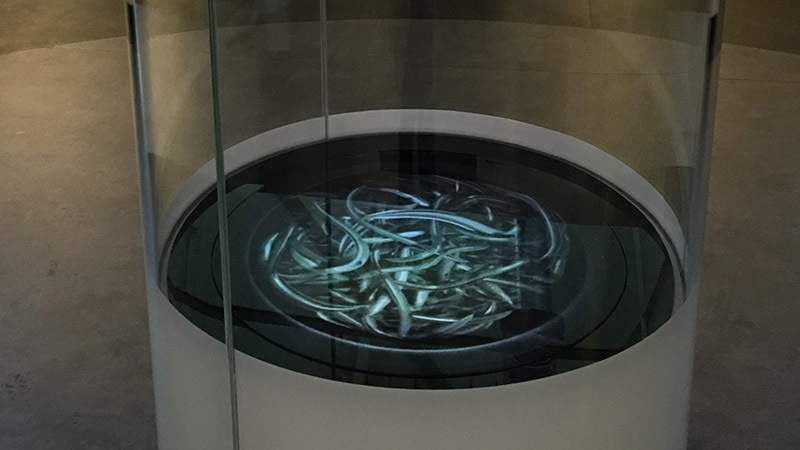 Bicycle wheels, potato peels, comets, blackberries and eels transform from one to the other in a circular mesmerising loop. 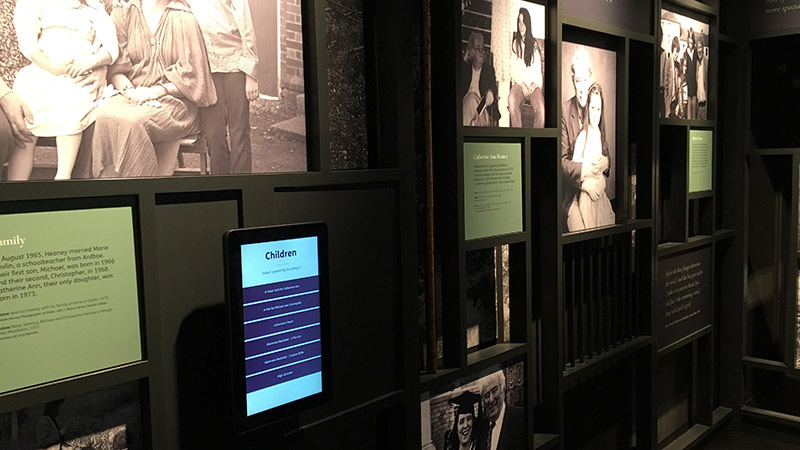 Applications were created to display the poetry on touchscreens throughout the exhibition, as well as ambient audio pieces and audio explanations of various poetry conventions such as rhythm and rhyme. Our writing team also delivered copy for graphic panels in the exhibition.